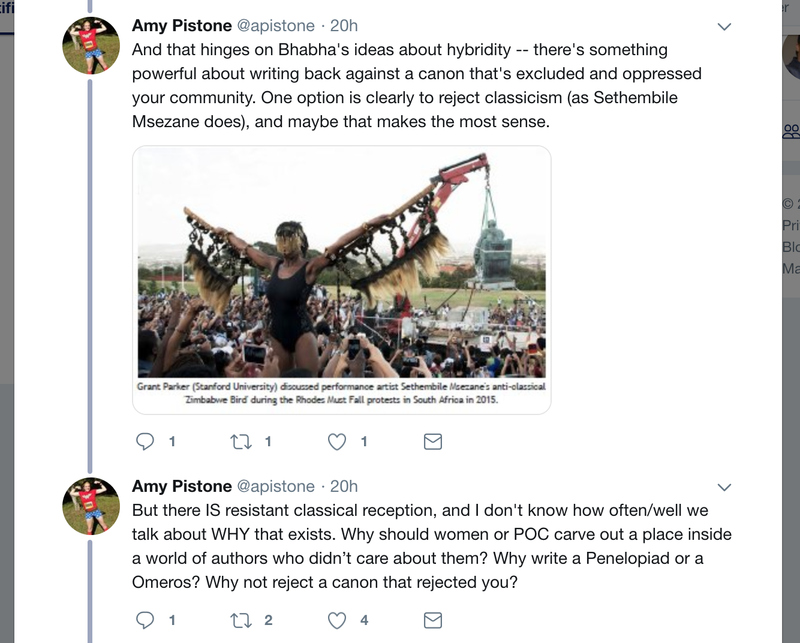 Stupendous colleague, Dr. Amy Pistone, recently tweeted some responses to my last blog post on the Claiming the Classical workshop that I think are really astute and worth engaging. Her response got me to think a bit more about one of the comments I made that she had thoughts on. Colonial contexts are complicated and have a complicated relationship to classics because of the history of classics as a tool for empire and exclusion. This means that there is no single reason or single way for those so excluded to engage with classics. Hybridity offers of good way to think about some of these engagements. Hybridity as a concept does have its limitations, however, as Rosa Andujar discussed in her discussion of Luis Alfaro's Mojada (Medea) at the Racing the Classics conference. sometimes decolonial receptions fail to interrogate their own racist foundations, particular in Latin America, where indigenous peoples are often inserted as pre-Columbian fantasies, frozen in time. Or, as Armando Garcia discussed at the same conference concerning Rodolfo Usigli, the elevation of the pre-colonial past still finds itself framed through European/Classical frames, while the indigenous falls prey to tragic tropes. The question of the positioning of classics as universal is not simple nor separate from the issue of resistance. It is, in fact, intimately connected and shapes that resistance in so far as the resistance is typically positioned by the resisted as 'particular' or as a self defeating and needless 'identity politics' vs that hegemonic, universal, and necessary 'classical.' This is because of this problem of classics as universal and its linked to European whiteness and maleness as 'norm' and the positioning of 'identity politics' as deviation from the supposedly universal norms of classical, European male whiteness and the social, political, and economic institutions that support it. This what I am pondering this morning. 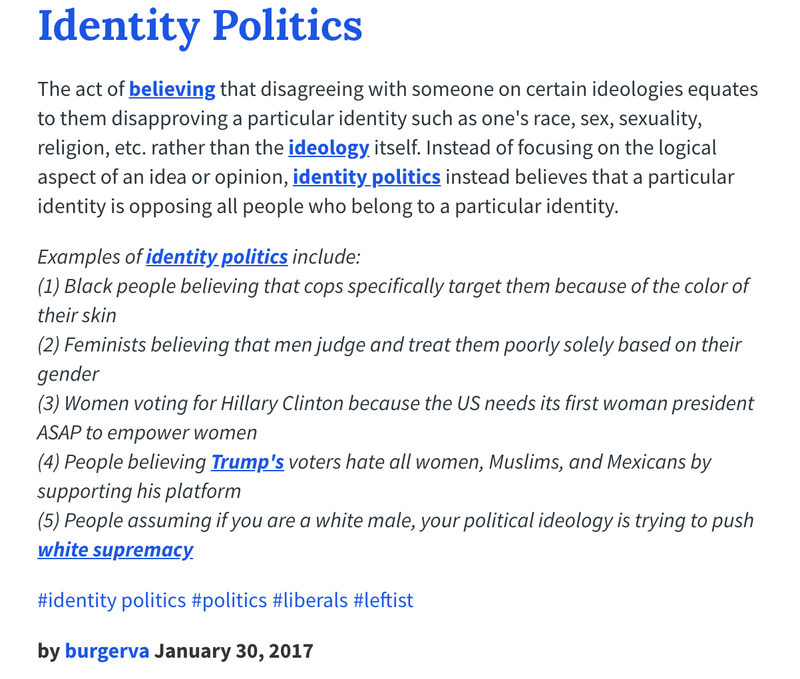 I know I'm not the first person to ponder this problem called 'identity politics' nor will my conclusions here be unique. Importantly for me, though, is the fallacy that the ancient world was without identity politics and any discussion of race, ethnicity, gender, sexuality, or class in classics is an imposition of post-modern, cultural marxist anachronism. This is patently false. 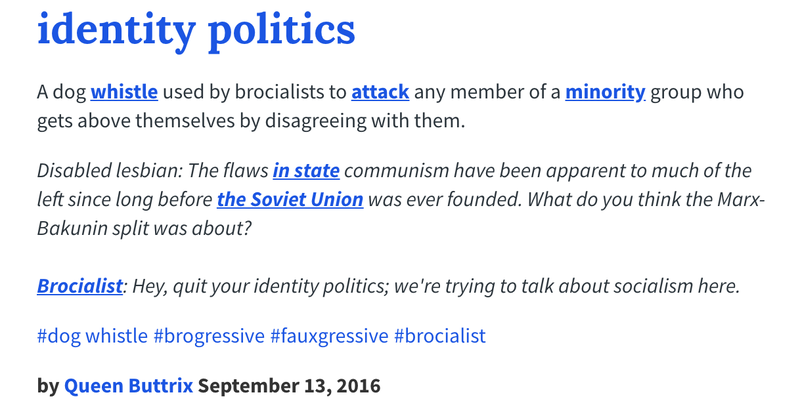 These may be reflective of what the average person thinks when they hear 'identity politics'. We can't say 'non-academics', of course, because there are ample academics who want to get rid of what they refer to as 'identity studies' or 'grievance studies' or, really, anything that isn't a traditional department, but instead is a 'studies' program and these are linked to identity politics. If this is one's attitude towards issues of identity in the contemporary world, it goes without saying that the same individuals will reject the study of identity in the ancient world. Or, will reject studies of identity in the ancient world that don't align with what they think of as universal types of identity vs. particulars. We see this especially with the issue of race and ethnicity. We've had about 30-40 years now of ethnicity studies in the ancient Mediterranean, but race is still nascent. Part of the issue is because racist approaches before 1950 to study antiquity used the language of race to mean explicitly a biological difference between groups of humans that impact their physical appearance and character and that physical appearance determines character, intelligence, etc. To counter this, the language of race was dropped and ethnicity (a 20th century coinage) was picked up and pretended frequently to be about culture, while often still essentializing that culture into geographic, national, heritable character and physical attributes. We also have the problem in the US that 'race' has been reduced far too often to a problem of whiteness and blackness. These are particular manifestations of race, not the sum total. But, when one says they are exploring 'race' in antiquity, there is an assumption that this means exploring blackness (as if blackness is itself inflexible and unchanging a concept). And, because of the way Classics and the classical world have been assimilated to whiteness in our contemporary world (I've written about this before), those who oppose the study of race in antiquity will point to the whiteness of Greece and Rome and the essentialist view that black = sub-saharan African and conclude that you are forcing modern identity politics onto the classical past. Again, it is an issue of the universal and the particular, but of a different kind. Of course, this may seem odd of me to say. I am suggesting here that he ancient world had identity politics that can be understood as aspects of race. The ancient Greek and Roman ways of understanding identity aren't universal and should not be assumed to be universal, but they do have particular ways of thinking that can help us understand that there is a somewhat universal aspect to the struggle over identity and one of its manifestations as 'race.' Meaning, we should not take the Athenians as a model for all that is 'civilized' and adhere to their anti-immigrant laws because they represent a universal norm that modern societies are deviating from. Rather, we should understand their anti-immigrant, anti-foreigner rhetoric and laws as particular manifestations of a more universal habit towards organizing humans that we call 'race'. This organizing habit called 'race' often manifests as a dominant group being set as the universal norm and any challenges by those the dominant group excludes are considered deviations and called 'identity politics'. How can I say this is a universal habit? Well, I can't say its universal. I can say, however, that it is transcultural and transhistorical. It appears in lots of different geographic spaces in lots of different time periods. My evidence for this is..well...there is a lot of evidence for it. But when I think of ancient Greece in particular, one of the easiest ways to see that identity politics existed and that it functioned in part in a way we might see as coinciding with the organizational principles of race and ethnicity is on tombstones. Tomb of Melitta. Athens. IG II2 7873/SEG 30.235. Tombstones from all over the ancient Greek world tell us the stories of the lives of everyday people--what jobs they did, whom they married, who their parents or children were, what they valued, how they were valued by others. These are all identities, or aspects of the identity of that person. We know that there are a politics to this based on who gets what sorts of images, what is said about them and how the tombs locate those people vis a vis the place of their burial. I'll demonstrate with an example. Here is the text of the tomb for a woman named Melitta. "[[Melitta]] daughter of the isotelês Apollodoros, Melitta the nurse. In this place the earth covers over the deserving nurse of Hippostratê, and even now she misses you. I held you dear while you lived, nurse, and still now honor you although you are beneath the earth, and will honor you as long as I live. I know that even in Hades, if there is any reward for the deserving, the foremost honors rest with you, nurse, in the house of Persephone and Pluto." Melitta's tomb was found in Athens and dates from the 4th century BCE. Her tomb tells us that she is the daughter of someone named Apollodoros, who was an isoteles. This means that she is the daughter of an Athenian resident foreigner (metic) who has been given a special status--he is exempted from paying the taxes normally only assigned to resident foreigners living in the city. This means that he must have done some sort of service to the state in order to be granted special privileges. She worked as a nurse. 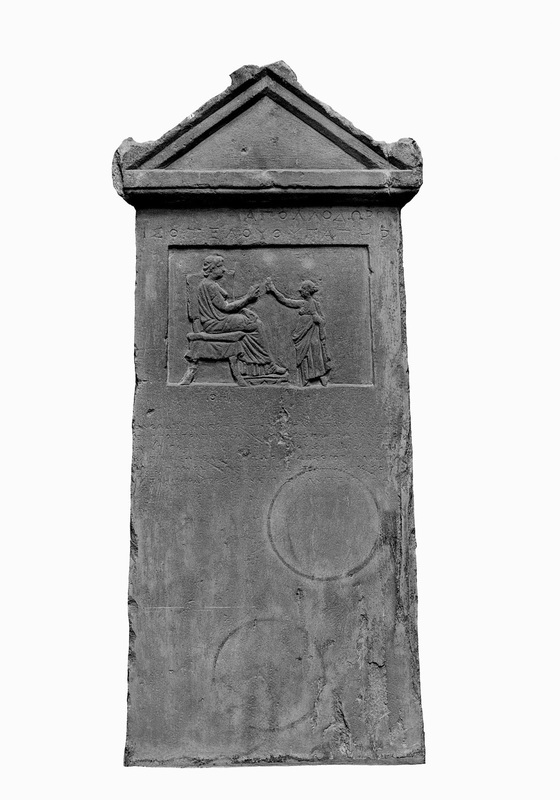 The image on the tomb pictures her with a child, who may have represented Hippostrate, whose family likely is responsible for setting up the tombstone. There is a lot going on here that tells us about the politics of identity in Athens. First is that the tax status of Melitta's father was so important to her identity that it IS her identifying characteristic on the tomb. It tells us where she ranks in the social and political hierarchy of classical Athens. She is the child of a privileged metic--her father wasn't a citizen, but he had managed to move himself up to one of the tax equality with citizens. Also important, however, is her job as a nurse. 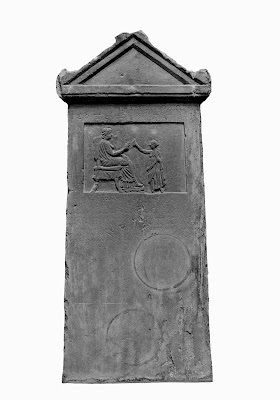 Not only does it sit right next to her identification as a privileged metic, but it is figured in the image and is the central identity highlighted in the tombs epigram. It is her relationship to the citizen family who likely funded the tombstone. It makes sense that the family she worked for would emphasize that she was a beloved caretaker in their family (probably long term). But why emphasize her political status within the city as part of the tomb? Because that identity mattered not only to Melitta, but it probably also mattered to the citizen family she worked for. They didn't have a slave nurse, they had a free(born) nurse. It elevated the status of the citizen family she worked for within the class dynamics of Athens. This is an instance of identity politics--the nurse Melitta is part of the politically excluded classes of Athens as both a foreigner and a woman. She is also 'working class'. But, she had access to some level of privilege in that her father had been given special status within that excluded class and she must have considered this an important aspect of her identity while alive. Her citizen employers thought it important enough to put it on her tomb. We might consider whether the use of the isoteles on the tomb to mark her privileged status among the foreign immigrants of Athens was an act of resistance to her subordinate, excluded status (as both a woman and a non-citizen). But, of course, she could only offer that resistance to being subordinated within the framework of her exclusion--isoteles marked her as both a child of privilege among foreigners in the city and as a member of a politically impotent class. Her work as a nurse underscored her inability to access the social status of elite citizen women who would never have worked as nurses, but only hired them. The hybridity might come from the fact that Melitta was likely also Greek and the iconography of the tomb and the use of the Greek language are shared by the community of Greeks to which the Athenians belonged in the broader Mediterranean. But her political status as isoteles only had meaning within the context of her subordination, her need to work as a mark of her exclusion from the norms of the citizen woman. 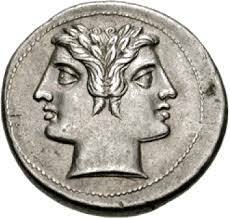 Melitta's family, like many Greeks in antiquity, probably went to Athens for the financial opportunities offered by an imperial city and trade center. They may have gone there under the pressures of the wars between Athens, Sparta, Thebes, Persia, ad others for dominance in the Aegean in the 5th and 4th centuries. Migrating to Athens may have brought them some financial stability, but they were continually marked out for who they were not by laws and norms of representation. 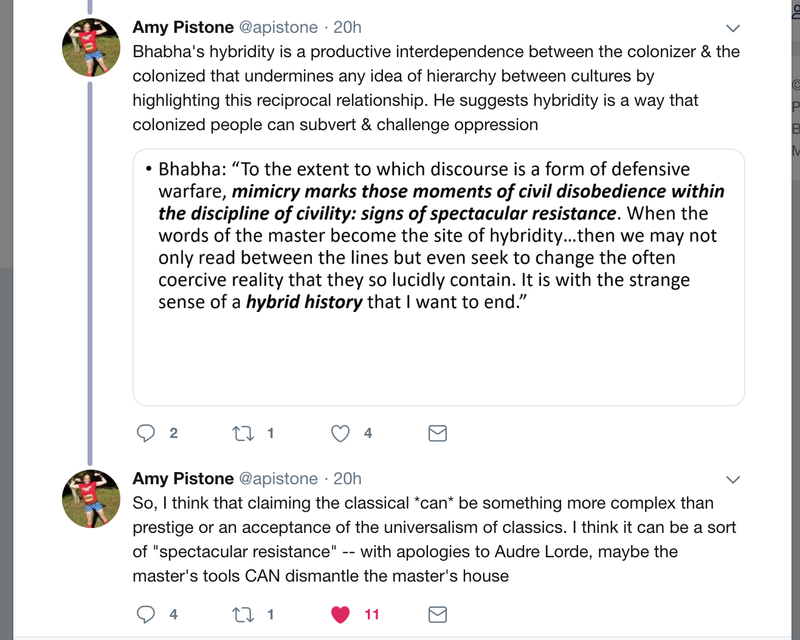 Another instance of a universal vs. a particular and of the potential shortcomings of hybridity as a theory for overcoming the discourse of empire. I am not sure if this post went where I had planned it to go when I started. Probably not. But that's ok. Because issues of identity are complicated. 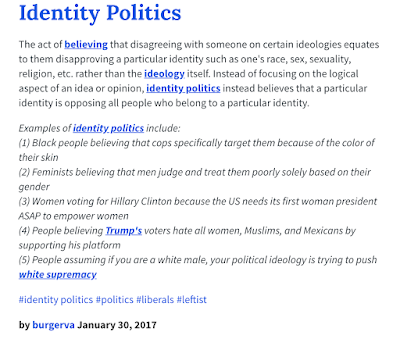 Identity politics--that thing that we supposedly should get rid of because it is destroying our society and has no place in the study of the ancient world--is a challenge to engage. But it is ingrained in the histories of the world and we do ourselves and future generations a disservice by pretending its some contemporary trend of leftist academics designed to undermine our social and political systems. Unless, of course, by undermine we mean 'point out the shortcomings and show how those systems punish and oppress members of non-dominant groups so we can make them less oppressive.' Because that is, in fact, the point. 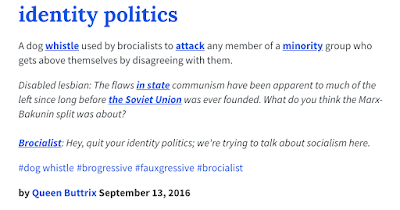 But, of course, those who want to exclude identity politics are likely those who already know how the system works and simply want to keep it that way.